It's a crazy hectic busy time of the year for me. I’m traveling frequently, prepping fresh fruit for storage, enjoying the weather outside, and heading off to Boston Thursday for the International Food Photography Conference. To say I’m a little behind is an understatement! My poor blog is suffering as a result of my frenzied life. I’ll do my best to write as I go, and hope you’ll forgive my lack of appearance a bit around foodie blogland. Come fall I’ll be trapped inside due to the Northern Idaho frigid weather and be my old self again. I want to say thank-you to my Dad for the first class ride to Boston and back! I have no idea what it’s like to be in first class, but I’m guessing I’ll enjoy it. I really appreciate the help. Since everything is going at high speed I’ve streamlined my cooking and baking. Nothing complicated has come out of my kitchen lately and this cookie is an example of that. I used my standard chocolate cookie batter and added a fun food product I found in the baking aisle: Dark Chocolate Raspberry Crème baking pieces by Hershey’s. 1. Melt 1 stick of the butter in a skillet over medium heat until deep golden. Set aside and cool for 10 minutes. 3. In a stand mixer, cream together the melted butter, softened butter, and sugar until fluffy. Add the eggs, vanilla extract, and vinegar and beat until well combined. Next, add the cocoa powder, baking soda, and salt and mix until combined. Add the flour and beat on low speed just until incorporated, be careful not to over mix. 4. Remove the bowl from the stand mixer and stir in the baking pieces. 5. With a standard (size 50) cookie scoop or 1 Tablespoon, scoop the dough onto the cookie sheets about 2 inches apart. Bake for 9 to 10 minutes until no longer wet looking. Remove from the oven and let the cookies rest on the baking sheet for 3 minutes. Move to a cooling rack to finish cooling. Notes: Melting half the butter in a skillet is optional. The cookies turn out well with 1 cup of softened butter too. These cookies are looking absolutely delicious to me right now. Id love some with my hot coffee. I am a dunker. Lovely! These cookies look great. 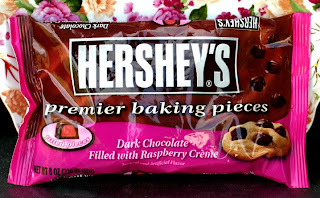 I have never seen the Hershey’s Dark Chocolate Raspberry Crème Baking Pieces so I will be keeping my eye out for them. Have fun in Boston. Oh my... these look very, very dangerous! PS - I had to sneak into your kitchen to pay you back for the time you snuck into mine (and left with all the goodies) :). Oops, forgot to mention, have a great time at the conference - you'll love 1st class. The first time I flew in it I felt a little guilty, but the comfort, room, and pampering quickly outweighs any such feelings - have a blast! Oh, and one last thing, if you think your blog is suffering in any way shape or form, you're nuts! Enjoy the conference. I'll enjoy these delicious cookies. Have a wonderful day. These cookies look delicious! I will now be on the look out for these hershey baking chips! Yummyyyyyyyyyyyy!!! Have a great time in the conference, when you get back a have a question for you. First class?? you are a lucky girl, bring us a lot of pictures. Extremely yummy! This is a great idea for using those tasty candies, if I can ever save enough to make it into the cookies.... Hope you enjoy the conference (sounds like fun) and first class. Oooh, I need to look for those baking pieces, because these sound delicious! 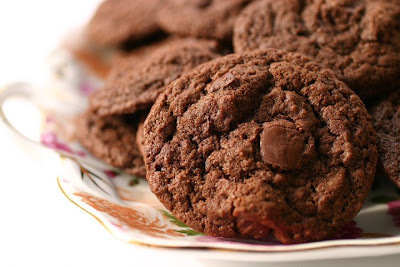 I used to make these cookies they are awesome but the last time I had planned to make them the store no longer had the chips and I couldn't find them on the Hershey's website. Where did you find your raspberry chips? This sounds crazy good! Especially the dark chocolate. Thank-you so much for the comments! Oh God, those look absolutely delicious! Ohh.. la la! Chocolate & raspberry anything makes my mouth water! Yummy, yummy! Ah, now I understand the First Class! Thanks Dad! I haven't been here to visit for a bit - I know what hectic is! Our move is looming on the horizon! These cookies look fab. Add one more to my "make" list. Yum!